If you’re looking for safe, all-natural (and fast) cold or flu relief for your family, try these top research-proven home flu remedies. You should have one or more of these flu remedies in your medicine cabinet before the flu or that cold hits you. Uh-oh… you’re feeling those dreaded signs of a flu bug. Some of us, upon feeling that tickle deep in the throat, will opt for flu treatments involving a prescription for the anti-viral med Tamiflu, but is it really worth it? And is it really more effective than home flu remedies? Studies show that Tamiflu may shorten the length of a flu by only a day or so—and to do so, it must be taken within the first 48 hours of flu onset in the patient. This means that if you don’t get to the doctor fast enough, Tamiflu, among the best flu medicine available, will not be a flu cure. FLU SEASON: WHEN DOES IT END? Not soon enough—there isn’t actually an official “end date” for flu season. See our post Flu Season: How Long It Lasts—and How to Survive It. One overlooked but critical step to avoid the flu is featured here: Hand Hygiene Is Key to Preventing the Spread of Infection. Furthermore, as with any prescription medication, there can be side effects with the Tamiflu flu treatment. Among them: nausea, vomiting, diarrhea, headache, coughing, and other respiratory symptoms—the same symptoms you’ll experience with the flu. And in the end, you might just be told to go home, rest, drink fluids, and use over-the-counter and home remedies for flu. Now how much did I pay for that advice? 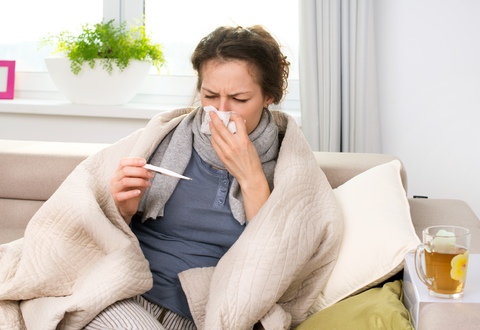 Fortunately, you do have other options to treat the flu at home—there are effective and natural flu remedies and cold remedies you can utilize at home, and we discuss them below. A major advantage of using one or more of these home flu remedies is that you can begin your treatment protocol much sooner than if you wait to go to a doctor. Most people think for the first day or two that they just have a cold. Often, by the time they finally determine it’s the flu, schedule an appointment, and get into the doctor’s office, the virus has fully manifested itself. But with these natural flu remedies, you can begin your treatment protocol immediately upon feeling those first flu symptoms: that scratchy, sore throat, runny nose, cough, and/or body aches. If it’s just a cold virus, these home remedies will help as well. And by getting your flu treatment going immediately, it will lessen the flu symptoms dramatically and shorten the duration. So let’s get to it. These are the top natural home remedies for the flu. Make sure you have one or more of these items in your medicine cabinet before a flu bug or a cold hits you. 1. Take oregano oil for flu and cold. Traditional healers since ancient times have used oregano extract as a natural remedy to treat respiratory issues such as coughs, colds, flu, sore throats, and bronchitis. Based on notable research studies, the volatile oils in oregano (thymol and carvacrol) have antiviral, antibacterial, and anti-inflammatory properties. In addition, oregano oil can help calm down stomach upset and aid in digestion by stimulating bile flow. Therefore, symptoms of nausea, vomiting, and diarrhea can be remedied by using the oil. Oregano oil is also one of the best home remedies for flu because it promotes sweating, which makes it useful to bring down a fever. When shopping for oregano oil supplements, try to find P73 oregano. Wild Oregano P73 stands for “polyphenol 73 percent” and is a specific blend of several high-grade medicinal wild oreganos. P73 oregano is also a rich source of natural vitamins and minerals—calcium, magnesium, phosphorous, zinc, boron, potassium, copper, and manganese—all of which help boost immunity. The adult dosage for P73 oregano oil flu treatment is anywhere between 3 to 20 drops, four times per day. Be sure to check the manufacture’s specific dosing instructions. Typically, you’ll put 3 to 10 drops in a tablespoon of water; swish it around your mouth and under your tongue for 20 to 30 seconds, then swallow. Repeat this 3- to 10-drop dosage in water once again so the combined two mouthfuls will give you 6 to 20 total drops of oregano. You’ll want to do this four times per day and continue every day until flu symptoms subside. For children 6 to 10 years old, 1 to 3 drops mixed with juice or water once per day will suffice. If the child is more than 10 years old, 1 to 3 drops with liquid 2 or 3 times per day is recommended. The oil also can be used to clear lungs and bronchial passages by mixing it with a base of olive oil and rubbing it on the chest and aching muscles or by boiling it with hot water or adding it to a vaporizer to inhale the steam. Be sure to read the label of any oil of oregano product other than Oregano P73. The primary component must be carvacrol. Other products may substitute with marjoram oil, which is not as effective for flu treatment. You have another medical issue (cancer or a rheumatoid condition, for example )or are taking medications that weaken your immune system . 2. Take NAC (N-acetyl L-cysteine). Another one of the best home remedies for flu is N-acetyl L-cysteine, which comes from the amino acid L-cysteine. You can expect to find it sold under the name “NAC” on the Internet or at your local health food store. Interestingly, NAC is most often used in hospitals to treat acetaminophen (Tylenol) poisoning because it binds the poisonous forms of acetaminophen that are formed in the liver. It is a powerful antioxidant that helps boosts immunity, reduces respiratory mucus and helps with breathing in various lung conditions. Research has shown NAC can reduce both the duration and severity of the flu. In fact, in a large study of older adults, only 25 percent of those taking NAC experienced influenza-like episodes over a six month period, compared with 79 percent in the placebo group. The NAC dosage taken during the six-month study was 600 mg twice daily. Even those with flu symptoms experienced a significant reduction in illness severity and duration. All subjects tolerated the treatment well. 3. Use olive leaf extract. Olive leaf extract (OLE) is an extremely powerful immune booster and flu treatment. The main constituent of olive leaf is the phytochemical oleuropein, and it is loaded with pharmacological activities including: antioxidant, anti-inflammatory, anti-cancer activities, antimicrobial activity, antiviral activity, and hypolipidemic (cholesterol-lowering) and hypoglycemic (blood sugar) effects. Olive leaf extract can be found in capsules, oils, and teas. For flu treatment at home, the capsules and teas work best. When buying a supplement, be sure it contains oleuropein. Adults and children can sip the tea several times per day. For the capsule dose, follow the manufacturer’s instructions. 4. Fight off nausea with ginger. Ginger root (Zingiber officinale) is an herbaceous perennial plant that produces the spice known as ginger, which naturally combats nausea and vomiting, making it an excellent flu treatment. Ginger is so effective at reducing nausea that it is often used to combat the effects of chemotherapy. The National Cancer Institute funded a study involving 644 people who had experienced nausea after one cycle of chemotherapy. Participants were randomly assigned to receive a placebo or ginger in capsule form once a day for 6 days. Participants rated their nausea on a 7-point scale, where 1 equals no nausea and 7 equals the worst possible nausea. By the end of the first day, patients who took the ginger (equivalent of one-quarter and one-half teaspoon of fresh or dry ginger) rated their nausea as 1 or 2 points, meaning they had no or very slight nausea. In contrast, those who took a placebo rated their nausea as 4 to 5 points, meaning they had a lot of nausea. For flu remedies at home, you can buy ginger root in capsule, powder, or extracts. Follow the manufacturer’s dosing instructions. You can also buy organic ginger ale (with no corn syrup) or ginger teas; sip the ginger ale or tea throughout the day as tolerated. Homemade ginger recipes are easy as well. Note: Do not take ginger root for flu treatment if you take medications for high cholesterol, diabetes, high blood pressure, or blood-thinners without consulting a healthcare professional. Probiotics are beneficial bacteria that keep your gut healthy and strong, thus boosting your immune system. You should begin taking probiotics before you get the flu, especially if you have been in contact with someone who is ill. If your GI tract is not adequately defended, you are more likely to experience illness. Probiotics are especially helpful for children’s immunity, particularly during the winter months. When selecting a probiotic, try to choose one that contains both the Lactobacillus and Bifidobacterium species of bacteria. Take the dosage recommended on the manufacturer’s bottle and double up on your dose to reduce stomach upset (nausea or diarrhea, for example). One of the easiest and best flu remedies is to drink water as often as you can. If you have nausea or vomiting, take frequent small sips. Look for signs of dehydration; seek medical attention right away if you experience any of these symptoms, especially in children: dry skin, dry mouth, thirst, decreased urination, dark-colored urine, heart palpitations, muscle cramping, headaches, or decreased sweating. 7. Use lots of honey, lemon, and tea as home remedies for flu. While you’re hydrating with water, keep a nice, hot cup of herbal tea at hand, and add organic honey and lemon not only for taste and vitamin boost, but to soothe a sore throat. Honey also is helpful in relieving your cough. You also may get a boost in essential vitamins and minerals from a daily multivitamin. Adults also may go for additional zinc, vitamin C, and vitamin D3 to boost immunity. And you’ll need B vitamins to help fight fatigue and weakness. 9. Apply penetrating heat for flu relief. For flu relief, keep a bottle of eucalyptus oil or Vicks VapoRub at hand. For helping to clear congestion, spread some of the oil or rub into a tissue or washrag; hold it up near your mouth and nose and inhale several times per day. 10. Best flu prevention strategy? Wash your hands! 11. Consider natural flu remedies. WHICH HOME FLU REMEDIES WORK FOR YOU? Have you used any of these natural remedies? If so, tell us about your experience in the Comments section below. By doing so, you can encourage other readers who are seeking a natural treatment option for their family. Let’s help each other through this tough flu season. Beta-glucan [1,3/1,6], found in baker’s yeast, mushrooms, and cereal grains. Cochrane Database of Systematic Reviews 2012, Issue 4. Art. No. : CD002744. De Flora S, Grassi C, Carati L. Attenuation of influenza-like symptomatology and improvement of cell-mediated immunity with long-term N-acetyl cysteine treatment. Eur Respir J. 1997 Jul;10(7):1535-41. “Beat the flu without a shot” by Mark Stengler, M.D. Sci Pharm. 2010 June 30; 78(2): 133–154. NCI Cancer Bulletin, May 19, 2009. 6(10). Originally published in 2013, this blog is regularly updated. add, alternative medicine, anti inflammatory, antimicrobial, antioxidant, b vitamins, bacteria, beneficial bacteria, best flu medicine, best flu remedies, best flu remedy, blood pressure, blood sugar, blood thinners, boron, bronchitis, calcium, cancer, cereal grains, chemotherapy, children, cholesterol, cholesterol lowering, complementary and alternative medicine, corn, corn syrup, cramping, dehydration, diabetes, diabetes high blood pressure, diarrhea, digestion, dry skin, echinacea, flu, flu bug, flu relief, flu remedies, flu treatment, flu treatment at home, food, ginger, headaches, health, health food, high blood pressure, high cholesterol, home flu remedies, home remedies, home remedies for, home remedies for flu, home remedies for the flu, honey, hormone treatment for prostate cancer, how long can you live with prostate cancer, how to take oregano oil, how to treat the flu, immune system, immunity, infection, integrative, integrative health, lung conditions, magnesium, medications for high cholesterol, mucus, muscle, n acetyl cysteine, nac, natural flu, natural flu remedies, natural health, natural remedies, natural remedies for cold and flu, natural remedy, natural treatment, oil of oregano, olive leaf extract, oregano oil, oregano oil flu, oregano oil for flu, organic, potassium, probiotics, remedies for flu, remedies for the flu, respiratory symptoms, rheumatoid, runny nose, side effects, signs of dehydration, skin, sore throat, sore throats, studies show, sugar, supplement, supplements, treatment at home, vaporizer, virus, vitamin, vitamin c, vitamin d3, vitamins, vitamins and minerals, vomiting and diarrhea, zinc. The best that works for me is juice from fresh ginger mixed with organic lemon juice and organic honey. Drink it every morning before breakfast. it is POWER! Keeps the germs away from me. from some of the information you provide here. Please let me know if this alright with you.